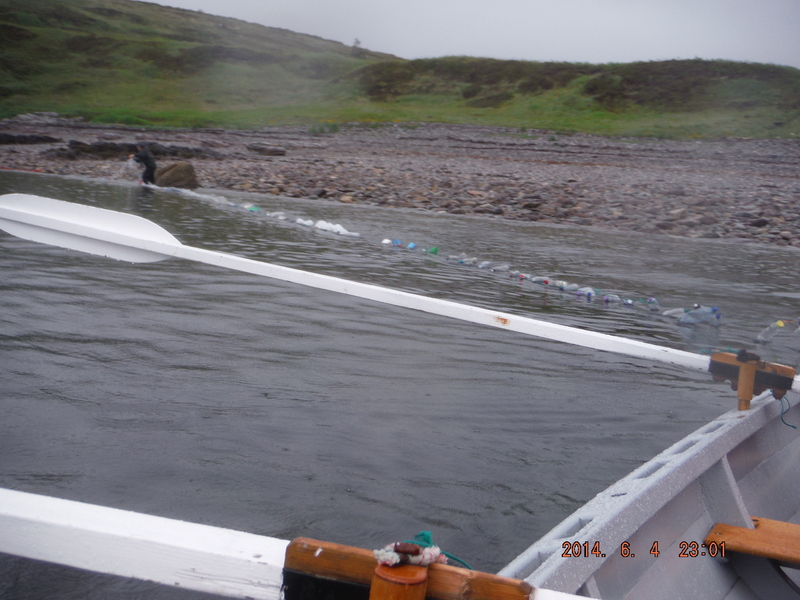 It may have been a grey dreich day but it has been a wonderful day crossing Loch Broom. 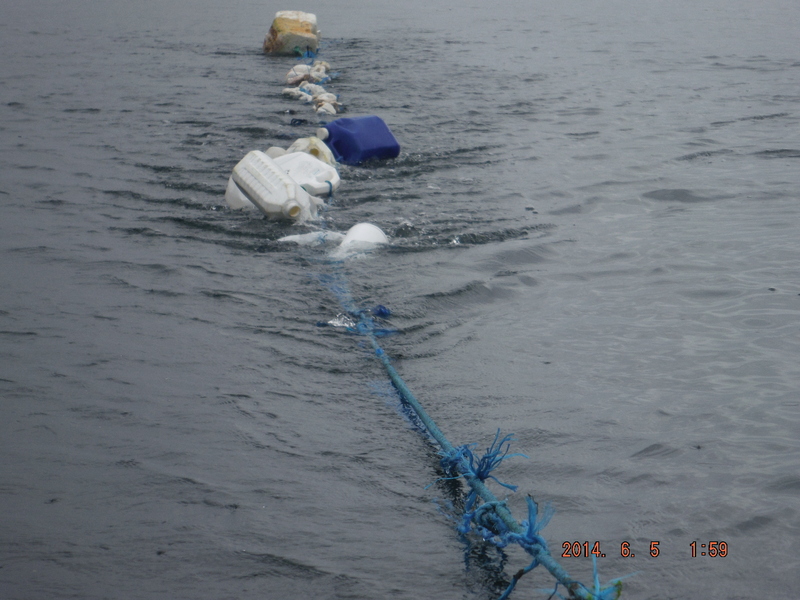 Two teams of people managed to successfully tow over 150m of litter off Isle Martin today, in celebration of World Environment Day. The thousands of pieces of litter were collected and joined together on the Back Beach of Isle Martin over the last two weeks. 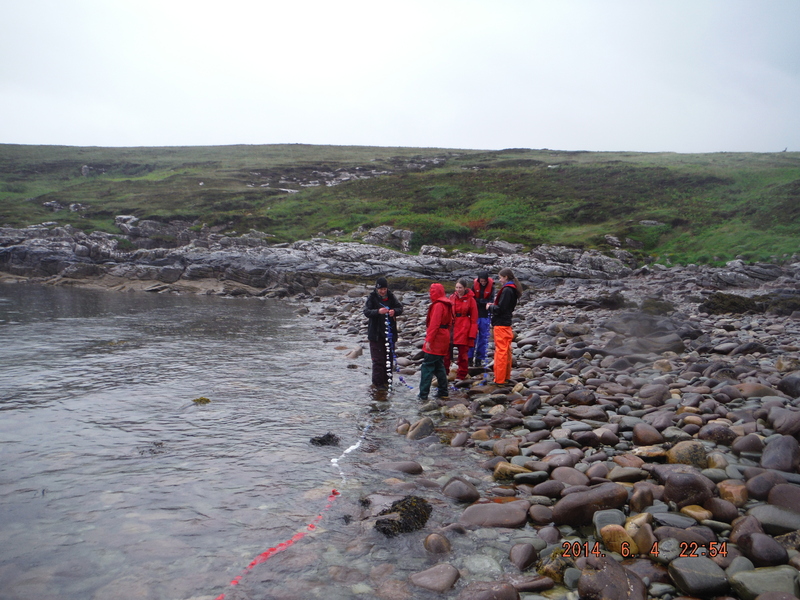 Thankfully the day started calm and warm though with light rain as the first team of Ullapool High School pupils arrived with Topher their teacher at 10.30am. After a very quick break for oranges and biscuits on the beach we carried the lines of plastic bottles and bottle caps down to the waters edge, where they were tied together and then onto the skiff. 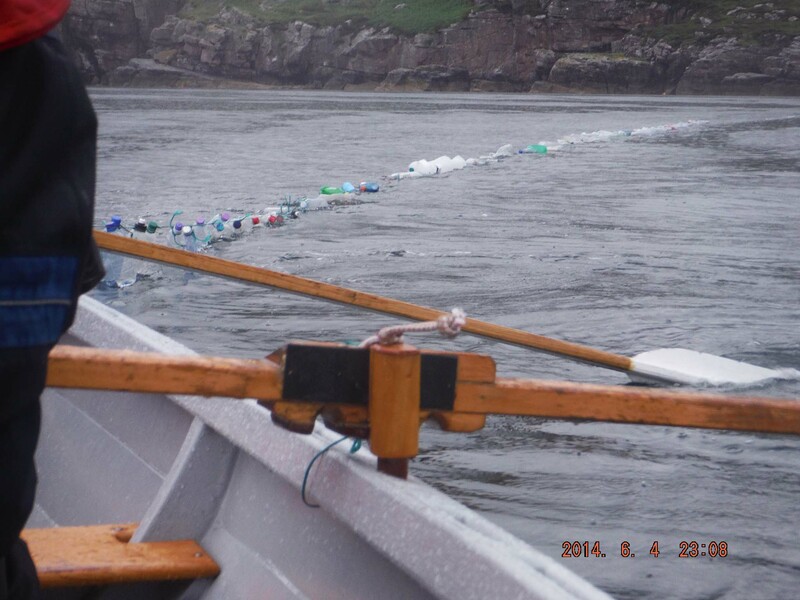 The line stretched over 75 metres behind the boat even though the bottles were light the drag they created , plus me being an extra person in the boat certainly made it a harder row back to were they had started from earlier. 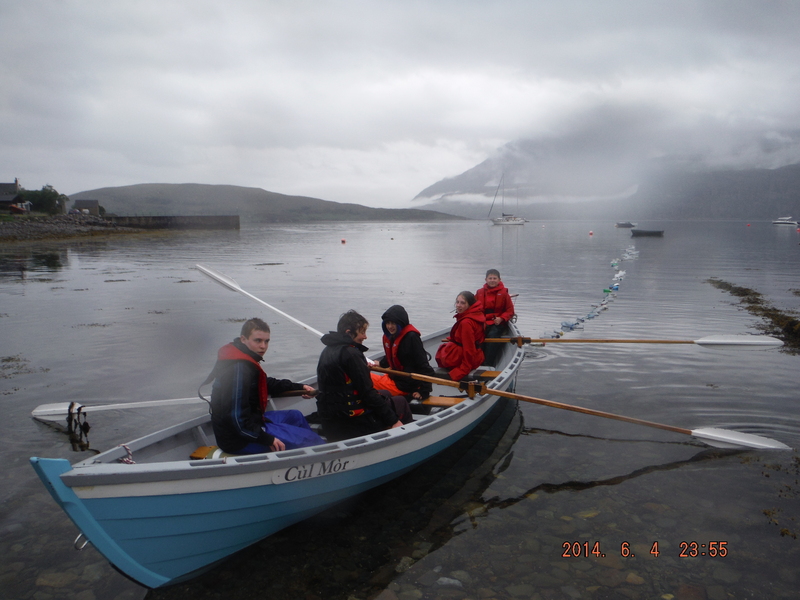 The team pulled together well and steadily and it was great to see a pupil steer us so well to Ardmair slipway through the moored boats and buoys. A great contribution to the project and to showing what we can do pulling together to care for the environment. Well done : Norman, Jake , Mairi, Mhairi and their teacher thanks also to the head teacher Robbie McFedries for coming out to cheer them in with Lesley Strachan their art teacher. 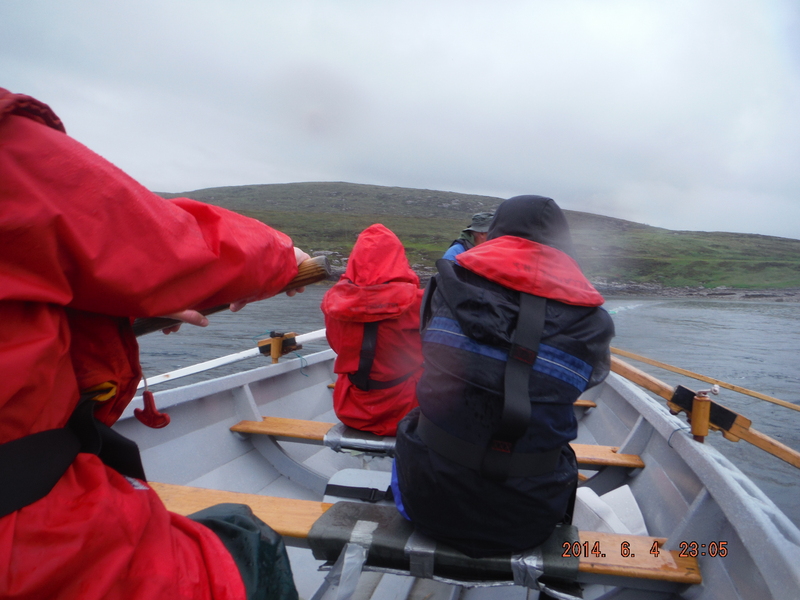 Our row out was magical as the rain eased and we glided swiftly from the shores of the mainland to those of the Isle in wonderful monochrome light and mist. 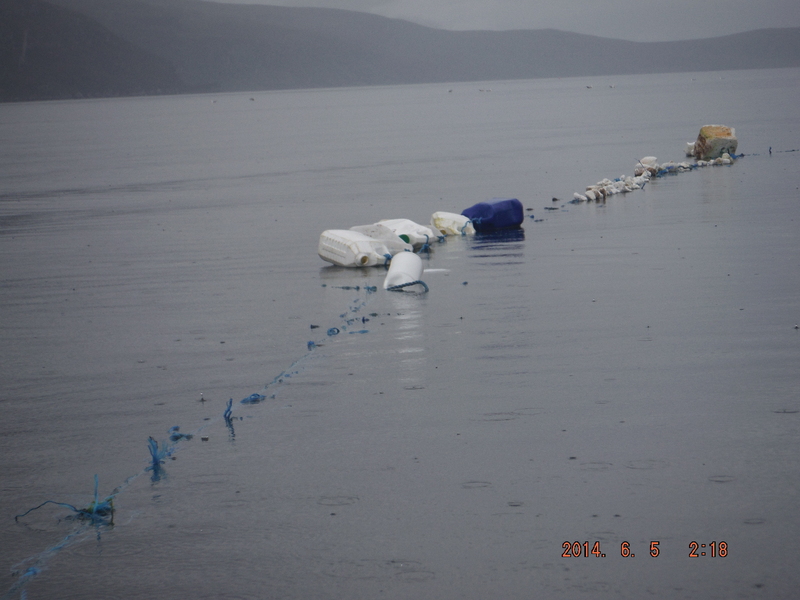 Ashore we selected the long blue lines of rope , plastic containers and threaded polystyrene to attach to the skiff . in a bid to get closer shots of the lines I took up the steering position. 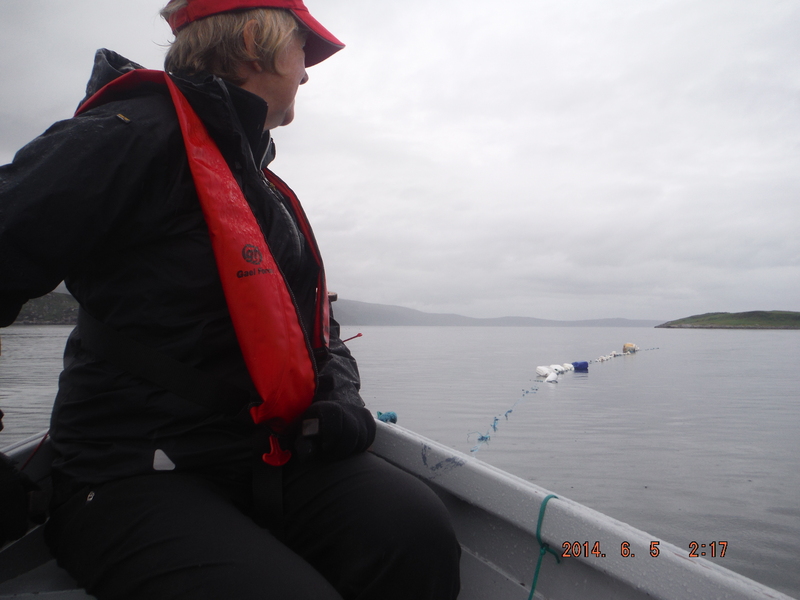 For this trip we had Cal on board as our living misquote in the bow of the boat with John. On the return we kept up a steady pace followed at times by cormorants seagulls and we think possibly accompanied at one point by a minky whale. Quite an entourage to witness the litter being removed almost all of which must have been washed up on the island as its not been habited for years. As we neared the mainland we saw that Dave (today’s photographer) had wonderfully returned to document our arrival and a group of holiday makers keen to see and hear about our endeavors . So the World Environment Day ( United Nations World Environment Program) message is spreading. To work together to make a difference no matter how small. Over the next few days I will tow the remaining litter lines off the Island and bag up the mounds of random materials that I couldn’t use and take across to the mainland to be picked up by the highland Council on Monday and in the coming weeks I will be tracking and reporting on the recycling journey each of the litter materials. What a wonderful inspiring project, and a rather beautiful day for towing the litter lines in, the images are a study in grey, rather painterly I think. Well done to all involved, and especially Julia Barton, who doesn’t have the word ‘impossible’ in her vocabulary! Litter picking is a fantastically life enhancing pursuit. I always feel better about myself and the world when I return from a walk with at least a few pieces of plastic rubbish to put in the (recycling) bin. It seems like a civic duty to me, rather like blood doning.. Let’s all keep on doing it, as well as attempting to solve the problem from the front end.